the membrane lining the cerebral ventricles and the central canal of the spine. adj., adj epen´dymal. The cellular membrane lining the central canal of the spinal cord and the brain ventricles. 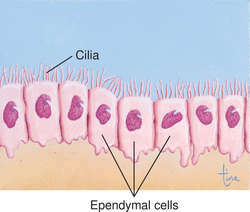 a layer of ciliated epithelial membrane that lines the central canal of the spinal cord and the ventricles of the brain. 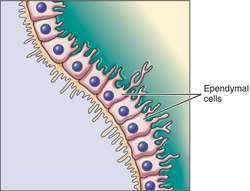 ependymal [ipen′diməl] , adj. the cells lining the cerebral ventricles and the central canal of the spinal cord; principal source of cerebrospinal fluid, mostly from where the ependyma covers the choroid plexuses.